A week after Rogers posted earnings in-line with expectations, BCE has done the same, announcing today that it earned 496 million in profit, or 58 cents per share, on $5.6 billion in revenue in the three months ending December 31st, 2015. The company added 91,000 net wireless customers in the fourth quarter, slightly below analysts’ expectations but well ahead of Rogers’ 31,000 for the same period. Total Bell Wireless customers grew 1.6% to 8,245,831. Wireless and its Fibe brand, which includes high-speed internet and TV service, continue to be Bell’s driving forces as wireline and satellite subscribers retract quarter over quarter. The company noted that there was a 23 percent increase in data revenue compared to the same time last year as more customers transitioned to LTE devices. On average, customers on LTE use 1.5GB of data per month compared to 1GB for customers on 3G. This data boost pushed blended average revenue per user, or ARPU, up 4.4 percent to $63.67, well ahead of Rogers’ $59.12 for the same period. Rogers now promotes postpaid ARPA as its defining metric as it focuses less on its dwindling, low-cost prepaid customer base. ARPU is the total revenue divided by the number of subscribers, and ARPA is defined as the average revenue per account. 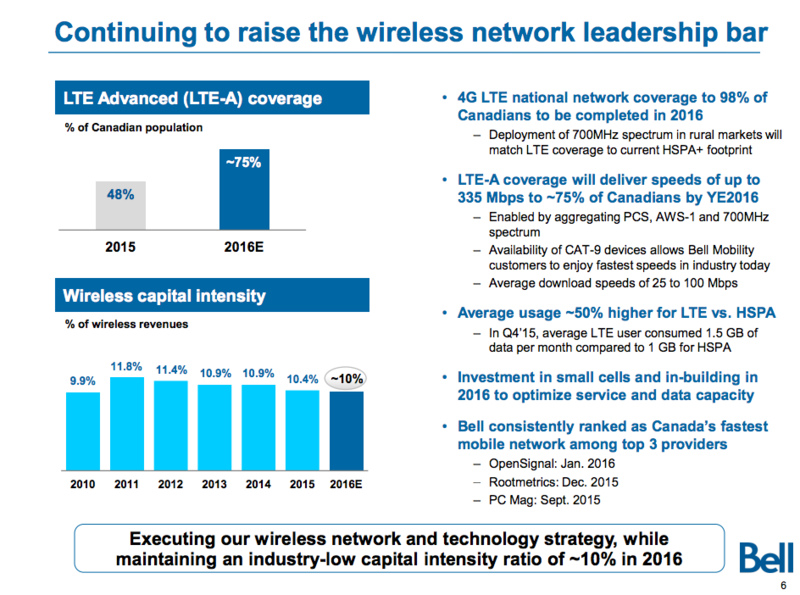 Bell announced that its LTE network now reaches 96 percent of Canadians, and will reach 98 percent by the end of this calendar year, fuelled by an expansion in 700Mhz spectrum deployment. Bell says that it will be the first Canadian carrier to match its HSPA+ coverage with LTE. The company also notes that its dual-band LTE, which aggregates AWS-1 and PCS, now reaches 48 percent of Canadians, with plans to expand to 75 percent by the end of the year. Its tri-band LTE service, which tacks on 700Mhz to that spindle, will proliferate throughout 2016 as more Category 9-enabled devices come online, supporting speeds up to 335Mbits. Elsewhere, Bell said that it added over 74,000 new Fibe TV customers, making it the “fastest-growing broadband TV provider in Canada.” While it didn’t add as many customers as the same time last year, Bell now has 1.18 million Fibe TV subscribers, more than offsetting the loss of satellite TV customers. After announcing that it was laying off 380 media jobs, Bell Media revenues were $816 million for the quarter, up 3.4 percent on higher conventional TV ad revenues. Bell notes that its exclusive deal to distribute HBO content in Canada, plus the launch of CraveTV to all Canadians, will continue to drive growth in the media business. For 2016, BCE expects one to three percent revenue growth and two to four percent adjusted EBITDA growth, in line with 2015. The company plans to boost its per-share dividend five percent in 2016 to $2.73 per share.